I had never heard of this book — The Search for WondLa — and took a complete gamble on it based almost entirely on its cover (I know, that’s strange coming from someone who fancies writing so much). I bought it as a read-aloud for my six year old son and myself, and boy, we just completely fell in love with this book. It’s the first of a trilogy and now we have to wait it out … and keep an eye out. In a nutshell, this book focuses on what used to be Earth and a young heroine, Eva 9, who must venture out of her protected underground sanctuary in search of other possible humans on the planet, now called Orbona. There’s action, good character development (including some tender exchanges between Eva and the robot who raised her) and lots of mystery as to why Eva is the only human here (which is not answered in this first book). Many young readers probably know writer Tony DiTerlizzi from his Spiderwick Chronicles (although oddly enough, my son and I know him from the wonderful picture book, Jimmy Zangwow Out of this World Moonpie Adventure.) 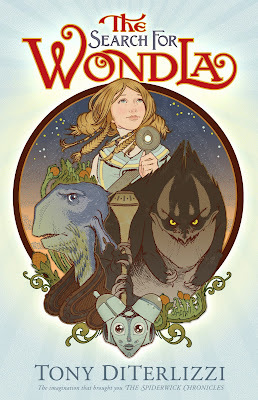 He has a fanciful imagination, and while there are one too many adjectives here in this book (even my six year old remarked on it), I found myself wondering where the adventure was heading and cheering on the remarkable girl main character. 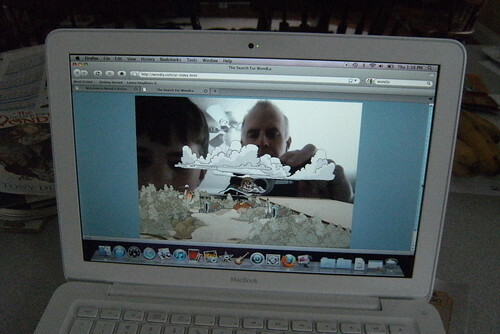 As an added bonus, the publishers have set up an Augmented Reality site as a companion to the book. It took me two computers to get it set up (my old PC seemed reluctant to be augmented) but once we had it going, the book works with the computer to open up series of a three-dimensional maps, which I found amusing and interesting. My son was fascinated by it. Halfway through the book, I already knew which of my students I would be handing this to when I got back from vacation (I have a set of twin girls who read everything, all the time, and they will just love this book. I bet they read it in one night.). In another strange twist, it turns out that an acquaintance/friend of mine — the graphic novelist Bryan Paul Johnson — helped with the coloring of the artwork here. Bryan has graciously worked with kids at my Webcomic Summer Camp and, we found out, lives in the lower level of the house where my band practices (yep, small worlds collide). It’s nice to see his name there in the acknowledgments in this fine book. I’m reading this aloud to my fourth graders right now and they LOVE it!! It’s nice to know we are on the same page (so to speak). I am going to show the book trailer to my class, they like making their own and this is a good one. I hope some of them will track the book down and read it. We are reading Because of Mr Terupt by Rob Buyea. It was published last year in October. The author is a teacher in USA and received some mentoring by Irving Stone. So far we are loving it. I will check out that book, Kathryn.